Now, I know that you are groaning a little right now, most of you moms out there. You are currently flashing back to the last barefooted run-in with a Lego brick, aren't you? Yes, I'll admit they are not my toy of choice, not that I still play with toys, they are, however; the Scout's weapon of choice. I would prefer my entire home to be an oasis of natural, imaginative play and Legos shatter my "slightly-crunchy" vision of a nature oriented home. I personally believe that Legos do not actually fit into that category. In light of the fact that I recently began a mission to help the Bug to rid her toy collection of non-natural play or items that did all the work for her, my choosing to post on Legos may appear counter productive. Hear me out. Legos are the lesser of two evils in my book and they actually can serve some useful purpose in the imagination department. Although they are made in China and composed of over-priced plastic, we will try to see the better qualities of this long loved toy. When considering the Scout, special considerations have to be made by this mom. Although almost 13 years of age, my dear son is a serious kinesthetic learner and still requires his Lego play-a-day habit. He has to touch things, take them apart and rebuild them in order to have his head or his heart reached. He is still growing and maturing at his own pace and his Legos are still vastly important to him. As a child recently diagnosed with Asperger's Syndrome and Obsessive Compulsive Disorder, consistency is key. Battling over the "Lego Issue" is just not a healthy option right now (maybe never) . . . pick your battles Mom! 1. History: Use Legos to have your child narrate a story, history lesson or role play. The Scout and Squeaker created this illustration of the Feudal System in England during the Middle Ages after a lesson in Mystery of History, Volume II. The Squeaker (who despises History) told me later in amazement, "Hey mom, when I did my quiz I totally remembered about the Feudal System and didn't even have to look it up!" Yes, it is amazing that your mom is cool sometimes. 2. Math: Let your child use Legos for math manipulatives and practice. 3. Grammar: Here is a super idea from Pinterest: Lego sentences! This works great for the Scout's and Squeaker's Shurley English. Create Lego pieces with words taped to them. The kids take the Lego pieces and use the various "sentence labels" required to build their sentence using the Lego words. 4. Art We use the various bricks to create 3D Mosaic-styled picures. We are privileged enough to be viewing one of the Scout's comic creations, Thunder Frog. He used Lego bricks to recreate his favorite character. 5. Logic: Memory and concentration is key, especially for two of my children, the Squeaker is dyslexic and the Scout has multiple sensory issues - Help your child by using various Lego bricks of different colors and arranging them in sequential order. Child gets 1 set of Legos and you have an identical set of Lego bricks. Sequentially order your Legos in a short row, starting with 4 - 6 Legos. Keep them covered from your child's view. Allow your child to observe the Legos for 1 minute. Now, have your child replicate the sequential order of your Lego bricks using their Lego bricks. Continue adding 1 - 2 bricks each time to your sequential pattern, then let your child replicate the pattern. Keep score of how many bricks your child is able to commit to memory. Then have them try to beat their "high score" each time they play. Set them loose to play this concentration game with one another. Here the Squeaker gets the Bug working on concentration. 6. Architecture: Have your child use their Lego bricks to replicate classical forms of architecture and famous buildings or landmarks. The Empire State Building, The Statue of Liberty, The Parthenon, The Taj Mahal . . . possibilities here are endless. 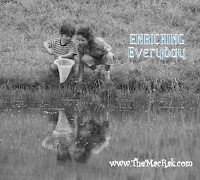 How do you use your Legos to Enrich Everyday? Let us know how you use Legos in your home education.